← Picture of the Week: Tupelo Honey Cafe’ in Raleigh! Durham’s Ponysaurus Brewing Co. Expanding Brewery & Adding Taproom! The Triangle’s craft beer scene continues to grow at an impressive rate! When I first moved to Raleigh in 2005 I could count the number of local breweries on one hand. Now there are more than 16 breweries in Wake County alone. Ponysaurus Brewing over in Durham is relatively new but they are already expanding their operations. I’ve enjoyed their beer and look forward to new things from them in the future. You can read more about the upcoming expansion, which includes the addition of a taproom in the official press release below. Follow them on twitter and facebook for additional updates on their expansion progress! After a year of production, Ponysaurus Brewing Co., the unique nanobrewery housed above The Cookery’s Front Room entrance, is moving its brewing facility to the corner of Hood Street and Ramseur Street. Production from the new location is anticipated to begin this spring. The new facility, a 6,000 square foot warehouse east of the Durham Bulls Athletic Park, will expand the company’s brewing capacity from 180 barrels a year to 2,000 barrels a year, in addition to providing space for a taproom that is slated to open in the summer of 2015. Ponysaurus brews can currently be found on draft at various Triangle establishments such as Mateo, Poole’s Diner, and Wine Authorities. The new facility, which will include a canning line, will expand the list of retail shops and restaurants where Ponysaurus Brewing Co. will be available, in addition to the cans and specialty bottles that will be available in the taproom. 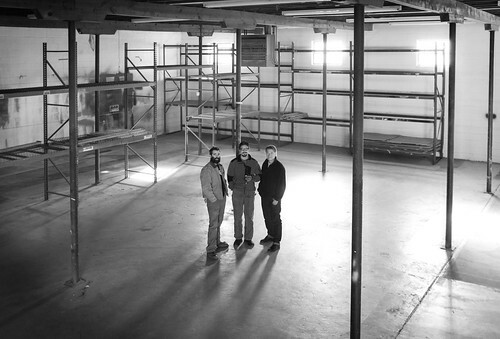 The brewing equipment at Ponysaurus Brewing’s current location inside The Cookery, a culinary incubator on West Chapel Hill Street, will be utilized at the Hood Street location as the brewery’s pilot system, allowing Jansen to continue to conjure experimental and specialty brews. Tagged as Brewery, Durham, NCbeer, Ponysaurus Brewing Co.